A full spectrum of overdrive tones with tons of clarity. 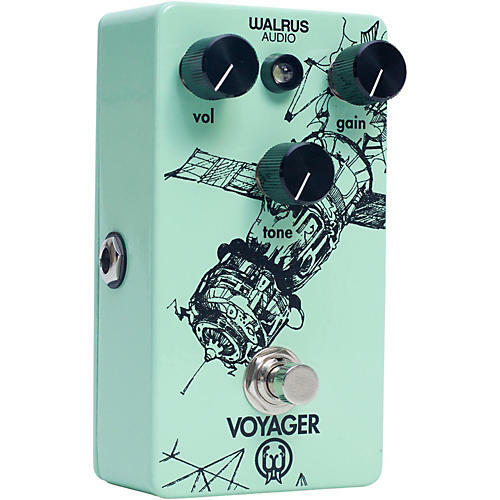 The Voyager is a gain/preamp overdrive that boasts a full spectrum of tone from any setting on its simple set of controls. From its lowest to highest settings, the Voyager provides a uniquely superb amount of clarity to any style of playing. At lower gain settings, it brightens the signal and adds clarity to each note played. With the gain turned up, the Voyager transforms into a thick overdrive, providing depth to chorded playing while retaining the clarity needed to break through on solos. The Voyager also features True Bypass switching. Dimensions: 4.77 x 2.9 x 2.3 in.